Balls of Steel are stainless steel drink coolers which can be used to add some much desired chill to whisk(e)y, rum or a mixed drink of your choosing. 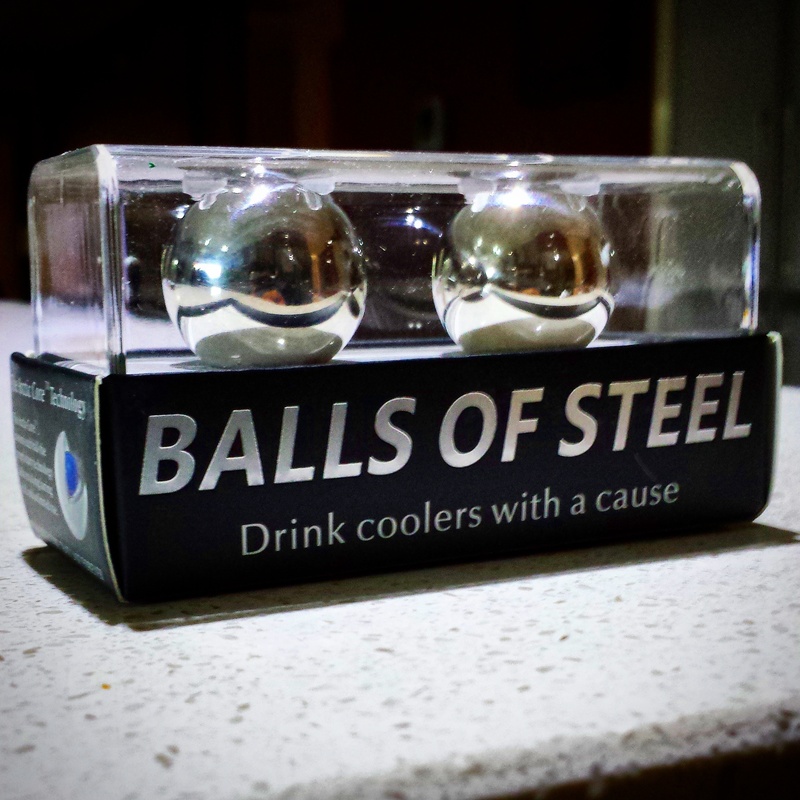 They are described as “drink coolers with a cause” because with every sale of a pair of Balls of Steel, 15% of the proceeds are donated to testicular cancer cure research. Powered with “Arctic Core” technology which is designed to keep your drink cooler for longer, these aren’t your average pair of balls. So sit back, adjust your family jewels for maximum comfort if need be, and let me explain what I liked and did not like about using Balls of Steel. 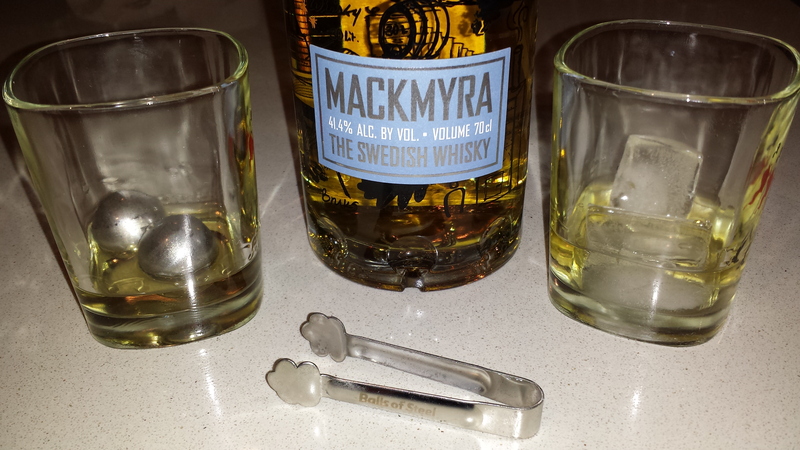 To test the alleged power of the “Arctic Core” I armed myself with a temperature measuring gun and began poured two carefully measured drams of Mackmyra bruskswhisky Swedish whisky into two tumblers. The temperature of the whisky was recorded at 20.4°C. I then dipped by pair of Balls of Steel (no pun intended) into one tumbler and two ice cubes in the other tumbler. 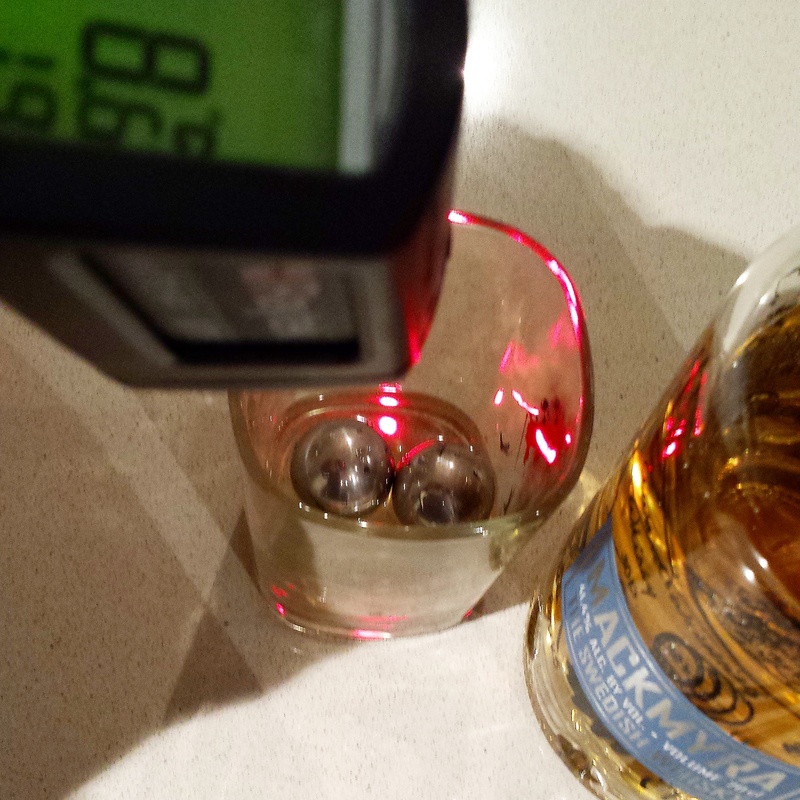 After a couple of minutes the surface temperature of the whisky cooled by the ice was 16°C while the surface temperature of the whisky cooled by the Balls of Steel was 11°C. For the next 10 to 15 minutes the surface temperature of the whisky cooled by the ice averaged approximately 11°C while the surface temperature of the whisky cooled by the Balls of Steel averaged 8°C. Then something happened. The surface temperature of the whisky with the Balls of Steel began to rise very quickly recording 16°C after 15-20 minutes while the surface temperature of the whisky with the ice began to fall recording 6°C also after 15-20 minutes. After 20 minutes I could roll the balls in my hand and not feel the any sub-zero icy cold temperature. By that time, however, the whisky containing the ice was very diluted and not very enjoyable. The Balls of Steel did not release any metallic smell or taste. It was not all smooth sailing however, and I felt that the Balls of Steel did not chill my whisky for as long as I would have liked. They performed their duty very well for about 20 minutes and then seemed to just stop working. The chill was far from powerful and quite subtle, which is something I enjoyed but it may underwhelm some people who enjoy their vodka out of the freezer or drinks filled with ice (I rarely use ice for anything, even mixed drinks). Overall, Balls of Steel are a great way to support testicular cancer research and subtly chill whisky without the whisky getting too cold, diluted by melting ice and tainted with the dreaded “freezer smell” and taste. I will definitely be throwing out my smelly old ice tray! I think Balls of Steel will be particularly handy during the hot summer months, when an outside dram or two can get a tad too warm after a few minutes without a drink cooler. Problem solved! This entry was posted in Uncategorized and tagged Balls of Steel, whisky. Bookmark the permalink.